An artistic impression of the expansion Port of Jakarta project. The expansion of Jakarta Port will be completed in 2023. Image courtesy of Indonesia Port Corporation (IPC). Mitsui & Co. has been contracted to build, finance and operate the first container terminal under the expansion phase. Image courtesy of Indonesia Port Corporation (IPC). Port of Jakarta, commonly known as Tanjung Priok, is currently being expanded to facilitate the movement of the largest container ships currently in service, including the larger ships of the future. The Indonesian Port Corporation’s (IPC) expansion project is being implemented in two phases. It is expected to require an investment of approximately Rp24 trillion ($2.5bn). The project will expand the port by adding seven new terminals and two product terminals, increasing the port’s container handling capacity to 18 million TEUs. The project received the environmental permit in January 2013 and construction works commenced in March 2013. The first terminal of the project will be commissioned in 2014 and the first phase is slated for completion in 2018. The entire project is slated for completion in 2023. The first phase of the project, which is currently underway, involves the construction of three new container terminals, each with a capacity for handling containers up to 1,500,000 TEUs per year, and construction of two product terminals, each with a capacity of 500,000m³ per year. The second phase of the project will involve the construction of four container terminals, each with a capacity of two million TEUs per year. "The project will expand the port by adding seven new terminals and two product terminals." Phase one of the project is being carried out on 172ha of area. The first terminal will be 850m long and the other two terminals will be 800m long each. The two product terminals will also have a length of 800m each. The draft of the terminals under phase one will be dredged at a depth of 16m, while the product terminals will be dredged at a depth of 19m. The terminals will facilitate two-way ship movement of approximately 300m wide ships. The four port terminals under phase two will have a draft of 16m, and a length of 1,000m each. The terminals will cover an area of 179ha. Expansion activities for phase one include land reclamation, laying of revetments and construction of an access bridge, a container yard and quay structures. The first terminal, which is being constructed on soft soils, including the complete container yard, will consist of a concrete deck on foundation piles. "The project received the environmental permit in January 2013 and construction works commenced in March 2013." Up to 25 million cubic metres of material, including ten million cubic metres of sand, is expected to be moved during the construction of the first terminal using trailing suction hopper dredgers, a cutter suction dredger and a backhoe. The materials are being pumped into closed basins adjacent to the new terminal for further expansion of the port. Reclamation and landfill work for the other terminals will be carried out by re-using material dredged from the port and from deepening the access channel. Seawater and nearby intakes will be protected from contamination by using silt curtains. 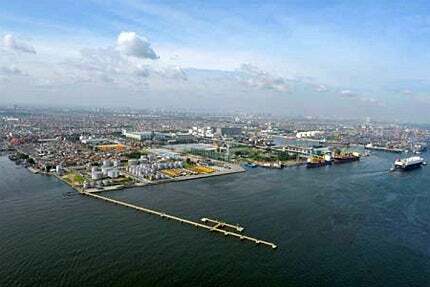 Other ancillary works include construction of an access road to provide access from a site east of the existing Port of Tanjung Priok. Facilities to accommodate power supply, potable and other water supplies, including appropriate waste water and waste disposal facilities, are also being developed to carry out the expansion works. The main supervisor for the construction of the first phase of the expansion project is Royal Haskoning. The company is being assisted by local sub-consultant PT Atrya Swascipta Rekayasa. The contract for the deepening of the port and reclaiming land for the new terminal area, worth more than €150m ($197m), was awarded to Van Oord in December 2012. The contract to build, finance and operate the first container terminal was awarded to Mitsui & Co. Port Botany Expansion (PBE), which won the Australian Construction Achievement Award in 2012, is a $1bn infrastructure project in New South Wales, Australia.